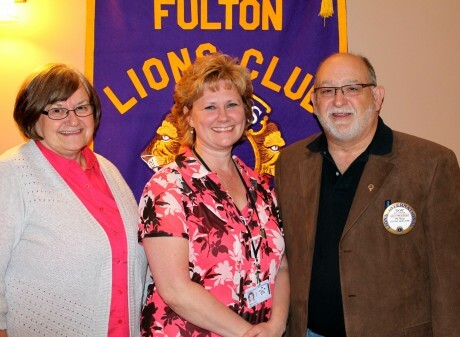 Representatives of Oswego County Hospice were the featured speakers at the Fulton Lions Club April 25 meeting. Oswego County Hospice offers comprehensive home care for the terminally ill who are no longer receiving aggressive or curative medical care. According to their web site: “The goals of Hospice is to promote optimum comfort and a personal sense of control with a focus on the quality of life.” Don LaBarge, Fulton Lions first vice president, thanks Lynn Bogart, (center) Hospice supervising public health nurse, and Sharon Westbrook, Hospice social worker for their presentation. The Fulton Lions Club, also know for their Lions Loot Sweepstakes and Labor Day Duck Derby, provides financial assistance for those in need of eyeglasses, eye exams and hearing aids to residents in the Greater Fulton area. For further information on Fulton Lions: www.FultonLionsClub.org or visit the Fulton Lions Club page on Facebook®. For more information on Hospice, visit: http://www.co.oswego.ny.us/health/hospice.html.